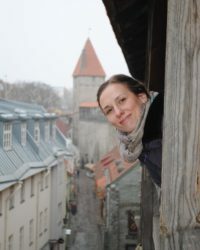 Anastasiya Astapova is a research fellow for Estonian and Comparative Folklore at the University of Tartu. She holds a Ph.D. in Philology from the Russian Academy of Sciences and a Ph.D. in Folklore from the University of Tartu. Her research interests are based on fieldwork she conducts in Belarus, Estonia, and Russia and include different forms of political mythology and ideology (nationalist narratives, conspiracy theories, belief narratives, protest movements, etc., especially in socialist and post-socialist countries), migration and asylum-seeking, as well as humor. “In Search for Truth: Surveillance Rumors and Vernacular Panopticon in Belarus,” in Journal of American Folklore, 2017. “Political Biography: Incoherence, Contestation, and the Hero Pattern Elements in the Belarusian Case,” in Journal of Folklore Research. “Counter-hegemony in Today’s Belarus: Dissident Symbols and Mythological Figure of Miron Vitebskii,” in Nationalities Papers.